Thompson Brothers Welding & Industrial Supply is a leading regional distributor of welding and industrial equipment, gases and safety supplies to support almost any hands-on industry. Since our founding in 1948, we've grown our business to support both individual and commercial customers in a wide radius across southeast Kansas and northeast Oklahoma. Family owned and operated since the beginning, we've built our company on solid American values. We pride ourselves on offering exceptional customer service, quality products and industry expertise to help you be successful in your business or personal endeavors. 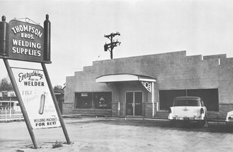 1948 - Don and Tommy Thompson opened the first Thompson Brothers retail location in Coffeyville, Kansas. 1965 - The family business was incorporated in the state of Kansas. 1978 - Brothers Rick, Nick and Tommy Thompson and brother-in-law James McGuire assumed the business. 1988- Acquired Mid-American Welding Supply, doubling welding and gas supply business. Also in the 1980's, purchased additional property in Coffeyville for construction of its gas fill plant, expanding its cylinder filling operation to include oxygen, nitrogen, argon, carbon dioxide, propane and several specialty gas mixtures. 2016 - Acquired Denison Welding Supply, adding store locations in Chanute and Fredonia, Kansas.